I Love Fudge! It is my weakness. 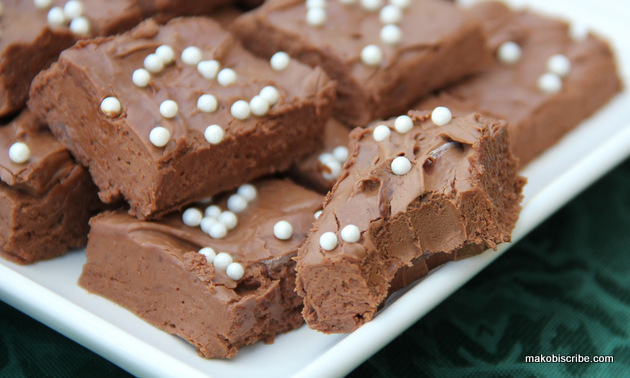 This Creamy Chocolate Butter Fudge Recipe will melt in your mouth. It is the old fashion kind, not the one made with marshmallows. It is fairly simple to make and great for the Holidays. For variations, you can add nuts, sprinkles dried cherries and more! Please make sure you stir constantly or you will burn the fudge and have to start over! This is one of the recipes we made at the Country Crock party – post coming soon!! Save your favorite recipes like this Vermont Tapioca Pudding Recipe on the web right to your ZipList online recipe box. You can even add ingredients from each recipe to your shopping list and take it all on-the-go to the store with ZipList’s free mobile app. To add a recipe to your list or recipe box, just click the “save recipe” button. Then sign up using your email address, Facebook or Twitter account. You can get the free mobile app for your iphone or android from ziplist.com. Would this work with butter? OMIGOSH. These look divine. I’m bookmarking this, I always wanted to make fudge! I love real, cooked candy! I just may have to make this. Oh Jen, why can’t you just come over and bake for me? 🙂 That looks great! Fudge is one of my downfalls. I seriously love the stuff and my mother in law makes it around Christmas. But I might need to try this recipe and make some of my own before that! Oh my gosh, I love fudge and that looks so delicious. It looks easy too with not so many ingredients which I love. I am not a fan of the fudge made with marshmallows, so this looks amazing to me! I seem to always have some Country Crock in the fridge, so I’ll have to give this a try. Oh my gosh this looks delightful (: consider it bookmarked!